UPDATED [March 2014] To reduce the potential risk of bleeding associated with the concurrent use of rivaroxaban and epidural or spinal anesthesia/analgesia or spinal puncture, consider the pharmacokinetic profile of rivaroxaban [see Clinical Pharmacology (12.3)]. Placement or removal of an epidural catheter or lumbar puncture is best performed when the anticoagulant effect of rivaroxaban is low; however, the exact timing to reach a sufficiently low anticoagulant effect in each patient is not known. Increased Risk of Thrombotic Events after Premature Discontinuation - Premature discontinuation of any oral anticoagulant, including Xarelto, in the absence of adequate alternative anticoagulation increases the risk of thrombotic events. Patients with Prosthetic Heart Valves - The safety and efficacy of Xarelto have not been studied in patients with prosthetic heart valves. Therefore, use of Xarelto is not recommended in these patients. The Print Ad is fals e or misleading because it minimizes the risks associated with Xarelto and makes a misleading claim. Keep track of your prescriptions for Xarelto, note the dosage you have taken and the time period over which you took the drug. Keep any containers of Xarelto and make a note of the pharmacies where you had your prescriptions filled. Xarelto is being marketed as an improvement to tradition anticoagulants such as Warfarin for patients that require frequent blood draws. However, there have already been reports of deaths and other serious life threatening Xarelto side effects reported since Xarelto was approved by the FDA. There has not to date been a Xarelto recall and the FDA nor the makers of Xarelto hinted that there is any reason to have Xarelto recalled. 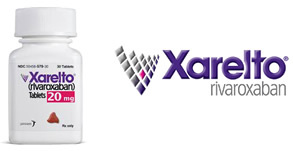 Xarelto has been associated with several severe side effects, including Xarelto internal bleeding. Furthermore, there is currently no antidote available to reverse Xarelto bleeding should it occur.